We were passing through and stopped here for a couple nights. It is just off the freeway and easy to get in and out of. Even though there is easy access to and from the freeway it is very quiet in the park. The restrooms were spotless and the grounds very well maintained. The area where the overnight guests stay is an asphalt area with lattice fencing to hide your neighbors utilities, each site has a picnic table and a tree. The trees are still young enough not to interfere with the site or satellite coverage. We gave this an over all rating of 4 only because the enclosed dog runs (there are 2 side by side in case your dog does not play well with others) are not in a convenient area. They are located at the opposite end of the park from where the overnight sites are and you have to find the road that leads you there because there is a ditch between the park and the dog run. A few little walking bridges would be awesome and make this much more user friendly. I notice most guests or residence used the large grass area right upfront to let their dogs run. I have no clue how this place is rated a 10 by Good Sam. Twice we've stayed here and have been assured we have a site on concrete (where sites are somewhat divided by bushes and have some space). When we actually get here, we have a site on asphalt that is like being in a Walmart parking lot with hookups. That is just plain dishonest. We have another RV park we use where we would have made reservations had we known this was what we would get. In addition we were backed to grass that smelled like pee because people walk their dogs there all day. You can't actually let your kids walk on the grass, because none of these people seem to pick up after their dogs! What's that all about? All the nice spots are for permanent residents here. The parking lot is for the visitors. Last time for us! This is a very nice park, just far enough off the freeway that it doesn't usually bother. We used this as a jumping off for all the Monteray Bay sights. It is really easy to get in & out of and spacious sites. The park, itself, was fine. Plenty of room for our dogs and great location. The bathrooms, on the other hand, were a different story. How do you say "dirty"? I don't think they had been cleaned in a long time. 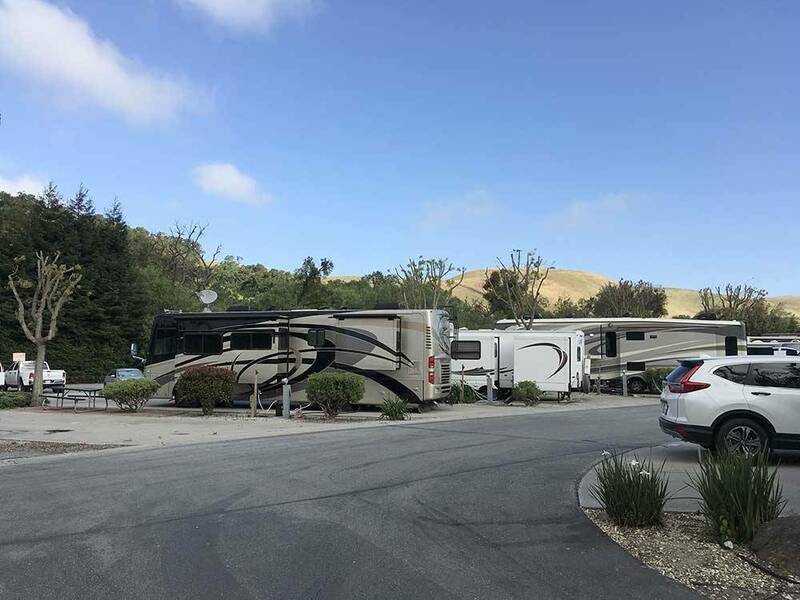 This is a great RV park if you are traveling or to use as a base to see the area. A lot of permanent RVers but the parks well maintained and clean. Front office very nice and escorted to campsite to help set up. Pool, gym facility and restrooms extremely clean. 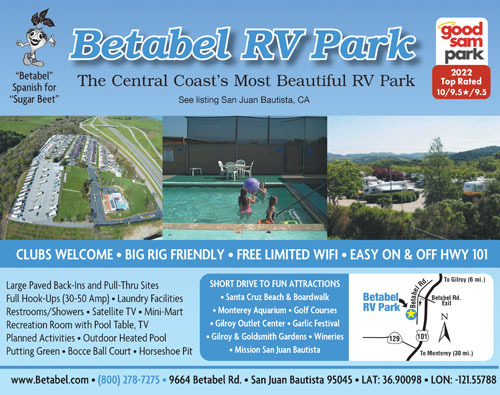 Great RV park!